Read up on the Open Beta FAQ to help get involved this summer. Get ready everyone, because Red 5 Studios has just announced that Firefall’s open beta will begin in mid-summer! Just in case you missed your chance at some free gameplay this past January, the majority of gamers will be able to see what this epic 5-player co-op, free-to-play, open world shooter is all about first hand. We’re incredibly excited to be nearing what we consider to be the most important stage of Firefall’s development – Open Beta. For us, Open Beta isn’t a traditional ‘marketing beta’, but rather an opportunity to include many more players in our community-driven development process. We’re looking forward to welcoming these new players into the community and continuing to build an amazing game together. City Power Levels: Players will receive new bonuses and rewards in the open world by increasing the power level of major cities through local missions and encounters. Melding Exploration: By raising city power levels and unlocking special dropships, players will finally be able to enter and explore pockets of the deadly Melding energy storm surrounding New Eden. Chosen Instances: Fortifying the open world allows players to take the fight to the Chosen, driving back the hostile alien race in epic new battle instances. Crafting and Progression: Players will continue to see major additions to crafting and Battleframe progression (including the new UI). Anyone can view the latest progress on Firefall’s beta access through Red 5’s new website: http://www.firefallthegame.com, as well as read up on the Open Beta FAQ here for all the questions you might have. Players can also grab their immediate access to the Open Beta (along with exclusive rewards) by purchasing the “Founders Pack” at: http://beta.firefallthegame.com/founders. This offer is in limited quantity, so get moving if you want the early access. If you haven’t already, we highly recommend checking out our co-op impressions of the closed beta! 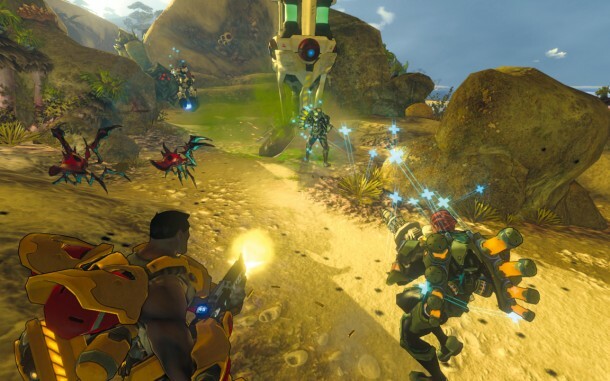 We absolutely loved Firefall from what we saw, so we expect great things to come out from the game’s co-op mode come July and its official release later this year.